The Leah began floating south after it lost power in the strait between Caithness and Orkney. Rescue: Lifeboat crews assist cargo ship. Lifeboat crews went to the rescue of a cargo ship adrift in the Pentland Firth. The Leah began floating south after losing power in the strait between Caithness and Orkney at 8am on Friday. The Thurso and Wick lifeboats were launched and are escorting the 100-metre long vessel back to port. The Leah was heading to Straumsvik in Iceland when it ran into difficulty and was back under way by 1pm after repairs were made at scene. A spokesman for the Wick RNLI said: "Our lifeboats were standing by the cargo ship after it suffered a loss of power in the Pentland Firth. "The Leah requested assistance and we were called by the Shetland Coastguard at around 8am. 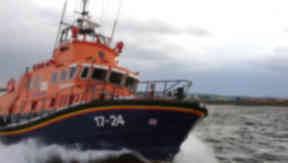 "Our lifeboat launched at around 8.15am and the Thurso lifeboat launched shortly afterwards. There was no danger to the boat."